Technical developments have changed how we communicate, and not only just when it comes to person-to-person. Advancements in programmable thermostat technology provide home owners easier, real-time ability to access their home’s temperature settings, and much more. If you’re considering a new programmable thermostat, check out devices that will help you maintain control over energy usage, while offering these amazing features. Wi-Fi-enabled programmable thermostats offer home-owners the way to review temperature settings and then make changes from a mobile phone (smart phone) or from a computer with access to the internet. These kinds of devices enable you to make fine-tuned adjustments in case the temperatures change drastically, for example. Just check the settings on your smartphone, and then make modifications for savings. Or, should your schedule change and you expect to go back home prior to the thermostat turning on your furnace on, rather than going back to a chilly house, alter the settings via your Wi-Fi capable thermostat. Another perk - web enabled devices offer is a web-based program that’s simple to view and change, as compared with small, often complicated touchscreen display panels on the thermostat. Smart thermostats are usually also Wi-Fi-enabled devices; however, they give you unique control over the home’s energy usage as well as your energy savings. These units “read” the patterns of cooling and heating usage over several days, and on auto-pilot adjust settings to guarantee optimum savings. They’re perfect for homeowners with steady schedules, and who might not want to or may not have any time to modify settings. Although it is not a programmable thermostat, some power companies have utilized technology to develop a “smart” meter to improve energy consumption in your home. With a smart meter placed in homes, power companies have better ability to access usage details, as the meter allows two-way communication. Ultimately, smart meters allow a far more efficient method to deliver electricity, manage peak demand usage, improve the power restoration process after power outages, lower electricity costs, and more. For people with any of these installed, the utility company may supply you with a thermostat additionally. 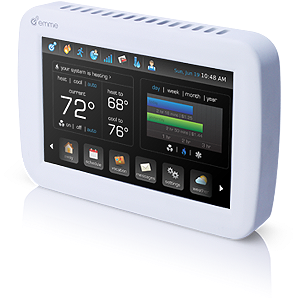 For additional information about programmable thermostats, email or call Sandium Heating & Air. We serve greater south San Francisco Bay area homeowners. This blog has a great info about air conditioning but if you want more you may go and visit on a/c in Encino.